Happy World Chocolate Day! Recipe for Chocolate Torte Cake. It’s World Chocolate Day today and we can’t think of a better way to celebrate it by indulging in chocolate cake! We would like to share our recipe for a delicious Chocolate Torte from QEII Taste. We hope you treat yourself but remember to save us a slice or two! 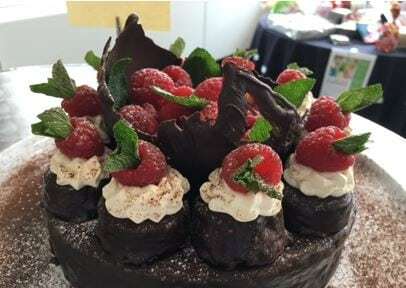 QEII Taste by Leith’s Chocolate Torte – Winner of the in-house bake off! Melt the butter and chocolate over a bain-marie. Whisk the eggs and sugar together until light and fluffy. Fold the flour and ground almonds then the melted butter and chocolate into the egg mixture. Be careful at this stage as you need to keep the air in the mix! Bake at 170’C for 40 t0 50 mins’ pierce with a skewer; if it comes out clean then the torte is ready. Melt the chocolate and butter over a bain-marie, allow to cool slightly and then stir into the cream. Once the torte has cooled, add the ganache and chill.